Another Prime Time exclusive. It has been copied but don't be fooled.........we invented this game! The classic Hot Potato kids game gone floating inflatable! Try to pass the “potato” down the row of cones without dropping it. Two sides to the table allow for competition between two people or teams. 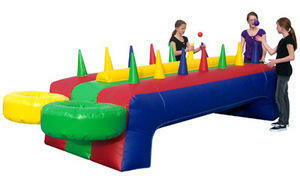 A great option for school festivals and other events where teambuilding activities will be played. Kids will be mesmorized!